Our German Wool Socks are new 100% gray wool reproduction Wehrmacht socks made in Germany. 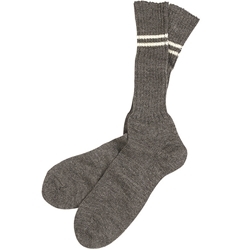 These wool socks are exactly like the WWII wartime socks in the correct gray color with white size rings. Available in three sizes (size 1, 2 or 3). A great addition to your world war two German collection or reenactment gear. Our German Wool Socks are new and in unissued condition.